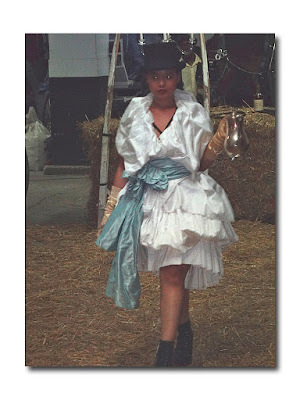 "High Tea at The Stables"
Yes, dear readers; it's true. NYFW Spring/Summer 2016 is a very different animal than the one I'm used to. It's a bit surreal, like that childhood nightmare in which your parents move without giving you the new address. I'm not sure if I'm in the throes of some abandonment issues or just identifying with Superman under the influence of Kryptonite. As you may know if you have followed me through any of my three previous adventures at fashion week, I had a talisman which guided me, grounded me, and gave me superpowers which sadly I've lost. Supposedly due to limited room at the new venues, many, including yours truly, were denied media accreditation. Now I'm adrift without my "magic" all-access badge (AKA photographer's pass). With it I was invincible in ways I could never have imagined. It made me prettier/smarter/bolder/ more creatively dressed, or so I imagined. It did everything including part the red sea for me (or at least the velvet rope); to mix metaphors from a comic strip superhero to a biblical one. So, you may ask, what am I left with? While NYFW has always sprawled, this fashion week is truly about the whole enchilada: this vast, trafficked island we call home. It's about being out there adrift in the Big Apple, in all its increasing grittiness. In case you hadn't noticed, which is damned near impossible, Gotham's glamour is being replaced by its pre-Giuliani seediness. As fashion week begins, I am being made painfully aware of the dichotomy of the haves vs. the have-nots and that those old Dinkins era "quality of life issues" have come home to roost (more on that later). My fashion week started off unsuspectingly enough, with an invitation to "High Tea at The Stables" featuring a fashion installation by Sofistafunk. 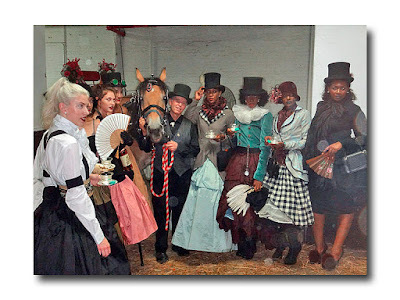 When I arrived at the West 52nd Street stables it became clear that something besides a fashion show was happening here. 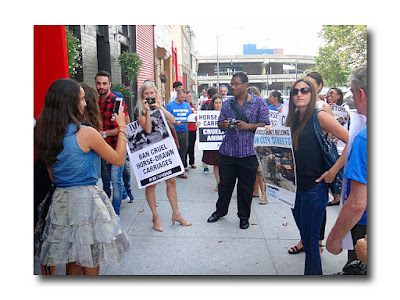 An ever gathering group of approximately 30 PETA protesters wore placards bearing bon-mots such as "Cou-torture" and launched verbal denouncements at the fashion show attendees over the perceived "inhumane" treatment of the equines. One mumbled some gibberish about the temperature reaching 90 degrees and was told it was just 89 degrees, therefore not technically too hot for the horseflesh, currently resting inside the stable with fans going. Meanwhile, the human flesh waited patiently outside in the massive heat and humidity. I immediately got a deja vu flashback to last year's spring/summer fashion week when a group of protesters made things difficult for designer Victor de Souza who had employed the horse drawn carriages on Central Park South for his models to ride in during his fashion showing. Incidentally, no one seemed to have much support for the protesters. A photographer told me that there are plenty of causes he feels strongly about however this just wasn't one of them. When a protester tried to interview me she made the mistake of invoking Mayor DeBlasio's name saying that he had made campaign promises to end the horse carriage trade and that's what people wanted or they wouldn't have voted for him. I told her that he needed to be more worried about the homeless humans in the city, the horses were doing just fine. Finally, upon entering the stable we got the main event: Sofistafunk (sofistafunk.com) and to wonder if they had thought about this sideshow when they selected the venue. Sofistafunk is primarily known for its "voluminous, picturesque and whimsical" skirt collection and vintage-y aesthetic. 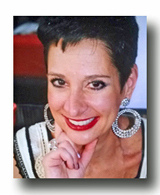 Designer Arlinda McIntosh worked on a production line at Norma Kamali's factory in the '70s, learning to do piece work and hand finishing of garments. 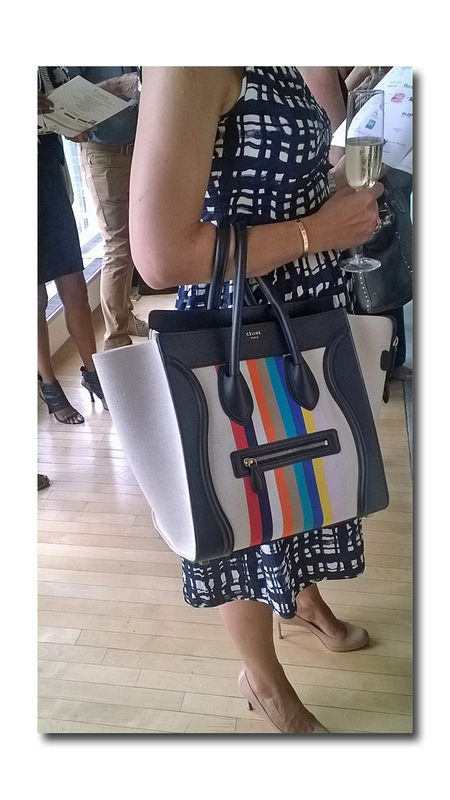 A part-time job at a convertible car top manufacturer enabled her to create colorful handbags from the remnants. Later she became known for hosting "Wine and Cheese Fashion Affairs," which were festive picnic-like events featuring her clothing. In 1994, singer/songwriter Faith Evans noticed the dress that McIntosh sported and asked if she could make her one to wear to a party. The rest is history as Sean "Diddy" Combs hired her to make custom couture for himself as well as Lauryn Hill, Mary J. Blige and Queen Latifah. 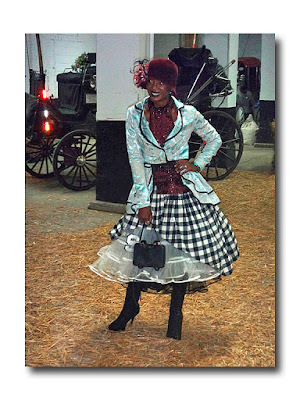 The clothing she showed at the stable was more theatrical period costume than wearable fashion but if you are into Steampunk (an apropos first syllable for how hot these models must have been) or Victoriana, now you know where to go. BTW, no horses were maltreated that I could see. In fact, one was nuzzled and given a carrot in return for submitting willingly to the paparazzi shutterbugs. He seemed to take it all "in stride." 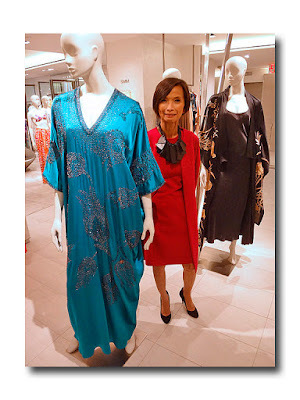 Next I traveled east to attend the launch of Josie Natori's couture lingerie caftan line at Bergdorf Goodman. I met and spoke briefly with Ms. Natori, a truly tiny birdlike woman whose hand I was afraid to shake lest it crumple Voldemort style. She told me that her inspiration was taken from the vintage caftans that she collects. Her line of heavily jeweled and brocaded caftans made of luxe fabrics including satin and velvet were priced at the designer gown range of upwards of $5,000! I'm guessing that these are aimed towards the one-percenters, particularly those in Dubai, because I can't fathom who would buy such an anomaly. Another observation at this event and indeed throughout Bergdorf's is that there are literally dozens of employees just standing around idly patting themselves on the back and seemingly chewing the scenery. What's up with that?! My last stop was just directly across Fifth Avenue : LVMH Tower's Magic Room for the 5th Anniversary of The Fashion Law Institute and a Mimi Plange fashion show. 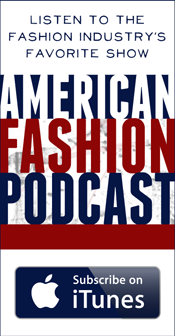 Ghanian born and hailing from So Cal, Ms. Plange began her ready-to-wear American sportswear brand in 2010. She is inspired by the lost civilizations of Africa and body adornment. A graduate of FIDM, she moved east, working as a designer/Creative Director for various sportswear brands before launching her own line. She has been featured in The New York Times, T Magazine, Vogue.com, WWD, Harper's Bazaar, Elle, Marie Claire, Glamour, Cosmopolitan and many international publications as well as worn by First Lady Michelle Obama, Rihanna, Vanessa Hudgens, Kristen Cavallari, Janelle Monae and many other celebs. 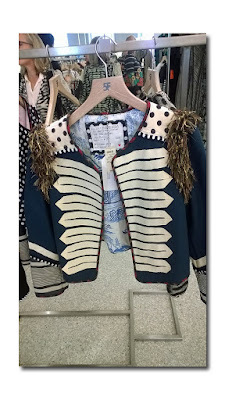 Although I found her collection a bit too restrained there were nice touches such as feathers, leather and summer tweed. 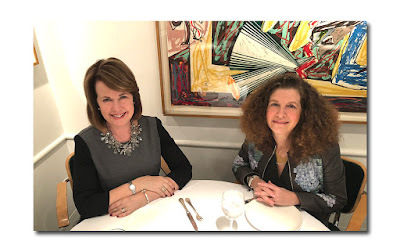 Mimi has collaborated with Manolo Blahnik on her Autumn/Winter 2011 collection which was exhibited in the SCAD Trois Gallery, Atlanta as well as SCAD's Moot Gallery in Hong Kong. Her trapunto LBD's were featured in Andre Leon Talley's LBD Exhibit at SCAD Savannah and the Minneapolis Institute of Arts. And IRL, there was Talley in attendance at the Magic Room show. I haven't quite figured out what's magic about the room other than the view and the instantaneous or "magic" way that the blinds suddenly opened as the show was about to begin. Incidentally, during the long wait for the show to commence I attempted to chat up a few LV toting ladies. Having selected one of my LV bags for the occasion as well, I commented on this fact and got crickets. Speaking of an LV coincidence/controversy, I recently was made aware of the fact that Louis Vuitton's 2007 red plaid designer tote is based off of the Pearl River Nylon Bags ($2-$6). They are also known as the "Ghana Must Go" bag according to this blog article and I happened to spot a homeless man with one such ripped tote who had taken up residence in the plaza directly outside my apartment building the other night. 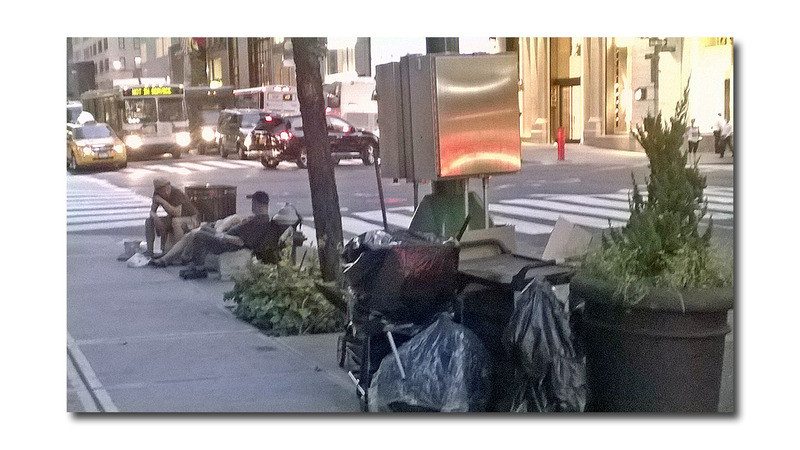 As I left the elevated aerie of LVMH Tower and walked along East 57th Street, the grimy reality of life here suddenly hit me again. A "Hooverville" of homeless folks were occupying the sidewalk in the high rent district between Madison and Park all but blocking my way to the crosstown bus, I had one more event scheduled featuring a free sneaker giveaway which I decided to forgo as the transportation to and from the downtown venue was the same price as buying the sneakers at Bloomingdale's. It occurred to me that the men on the sidewalk could use the shoes much more than I . It's still very early in the game of New York Fashion Week but my initial impression is that it's trying too hard. New York City on the other hand, isn't trying hard enough.